About ten days ago I posted about my search for Rebecca Rosenzweig, my grandfather’s first cousin and daughter of Gustave and Gussie Rosenzweig. I had certain hunches about who she married and what happened to her, but was awaiting documentation to confirm those hunches. 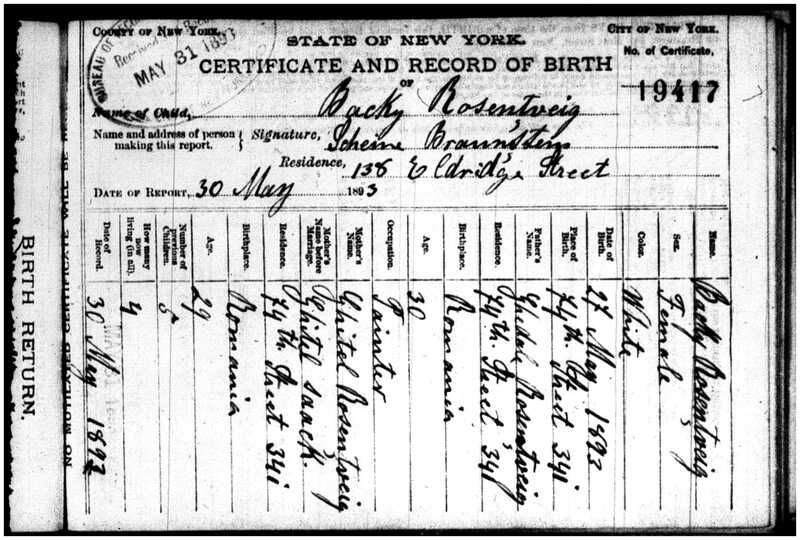 The first document provided evidence of Rebecca’s birth on May 27, 1893. One mystery raised by the birth certificate is that it reports that Gussie had already had five children, four of whom were then living. According to my research, in 1893, Gussie had four living children, Lillie, Sarah, Abraham, and Rebecca, and one child who had died, David (1891-1892). Who could the other child be? Lillie was probably born in 1885, Sarah probably in 1887, Abraham probably in 1889, David in 1891. 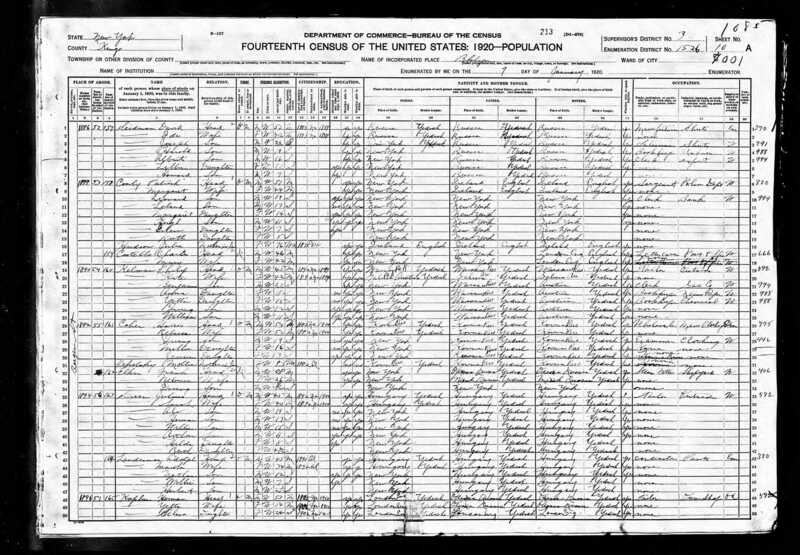 Was there another child who was born between 1885 and 1893 who was living in 1893 but who died before the 1900 census? A quick search of the NYC death index for children with surnames that sound like Rosenzweig who were born between 1885 and 1893 and who died between 1893 and 1900 turned up a horrifying number of young children who died in that period with surnames similar to Rosenzweig: 366. My guess is that one of those 366 children was a child of Gustave and Gussie, just adding to the list of children they lost. I will have to sift through them and search for the death certificates to see if I can figure out which ones might be my lost cousin. 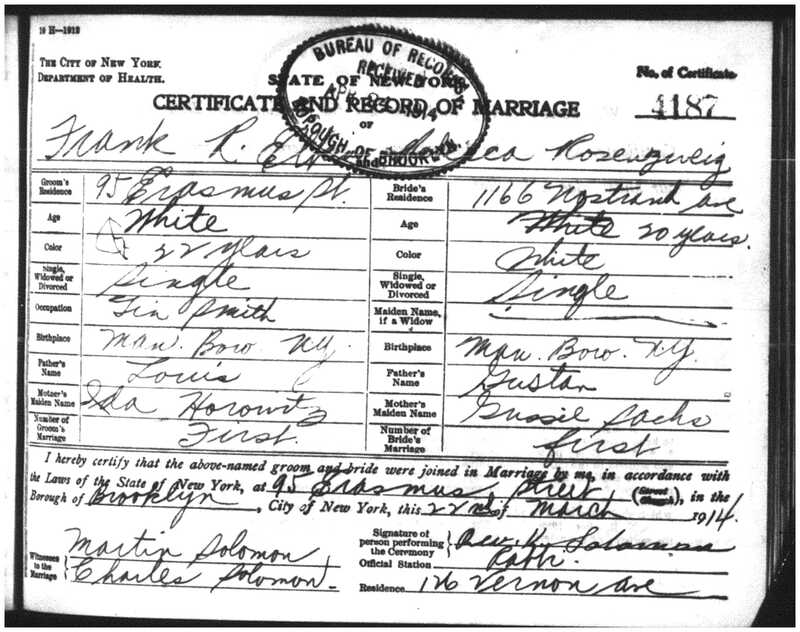 One hunch I’d expressed in my last post was that Rebecca had married a man named Frank Elkin in 1914, based on the fact that there was only one Rebecca Rosenzweig in the NYC marriage index for the appropriate time period. 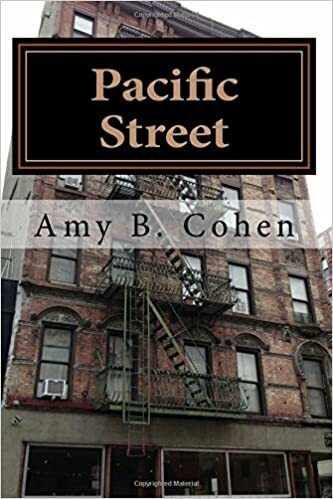 I was also sure that this was correct because she and Frank ended up living on the same streets as Rebecca’s family on both the 1915 and 1920 census reports. I also wondered whether Rebecca was the one who introduced my grandfather, her cousin, to my grandmother, her neighbor on Pacific Street. My hunch that this was the right Rebecca was confirmed when I received the marriage certificate. This is obviously the correct Rebecca, as seen by her parents’ names on the certificate. Rebecca was living at 1166 Nostrand Avenue, the same address Gustave gave in 1913 when his son Harry died. Perhaps this means that Gustave and Gussie were still living together in 1914 when Rebecca married Frank. Having confirmed that I had the correct Rebecca, I now knew that the information on the 1920 census reporting that Rebecca’s parents were from Minsk, Russia, was incorrect, just another example of how unreliable census information can be. More importantly, I was also now able to trace what happened to Rebecca. I had not been able to find her on the 1930 census, but I had found a Frank Elkin, living with his parents Louis and Ida and siblings in Brooklyn, along with a woman named Fannie, listed as the daughter-in-law of Louis, and two children, Irwin and Stanley, listed as Louis’ grandsons. From the marriage certificate, I now know that the Frank who married Rebecca was the son of Louis and Ida Elkin, so this was clearly the same Frank. But where was Rebecca? Who was Fannie? And who were Stanley and Irwin? 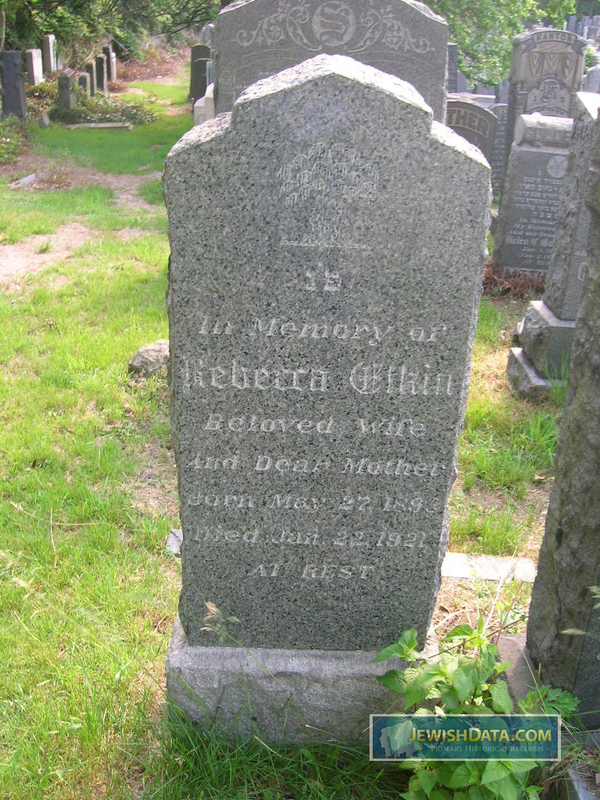 I could not find a death certificate for Rebecca, but I was able to find a headstone through Jewishdata.com and findagrave.com. I knew now that Rebecca died on January 22, 1921, just two years after her son Irving was born in 1919 (as per the 1920 census). She was only 27 years old. Having confirmed that Frank Elkin was in fact Rebecca’s husband, I wanted to figure out who Fannie and Stanley were—were they his second wife and child or the wife and child of one of his brothers, Edward or Matthew? 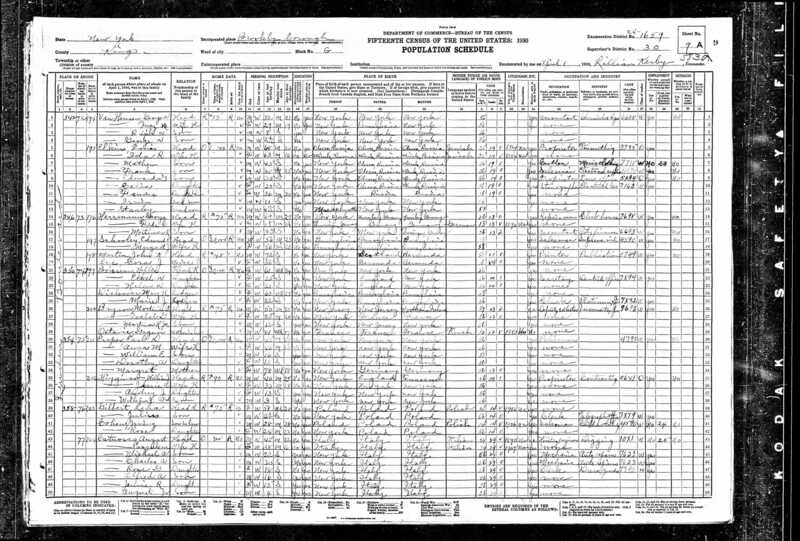 I looked back at the 1920 census and found Frank’s parents Louis and Ida and his siblings. His brothers were both single and living at home. I then searched the NYC marriage index for Edward and Matthew Elkin and saw that both were married after 1930. Thus, I inferred that Fannie was indeed married to Frank as of 1930. But I could not find a marriage record in NYC for them. 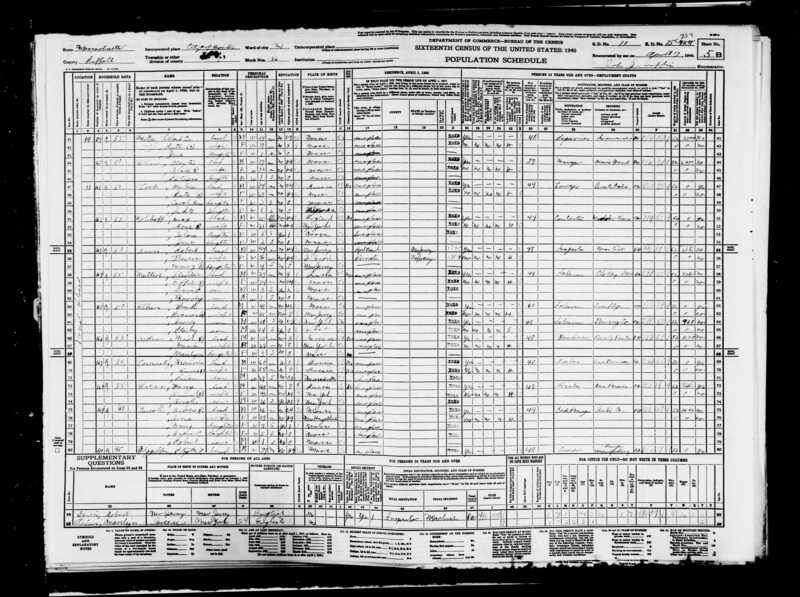 I searched forward to the 1940 census and was able to find a Frank and Frances Elkins with two sons, Irving and Stanley, living in Boston. Could this be just coincidence? The sons were the right ages—Irving was 20, Stanley was 14. Frances could certainly be the same as Fannie. 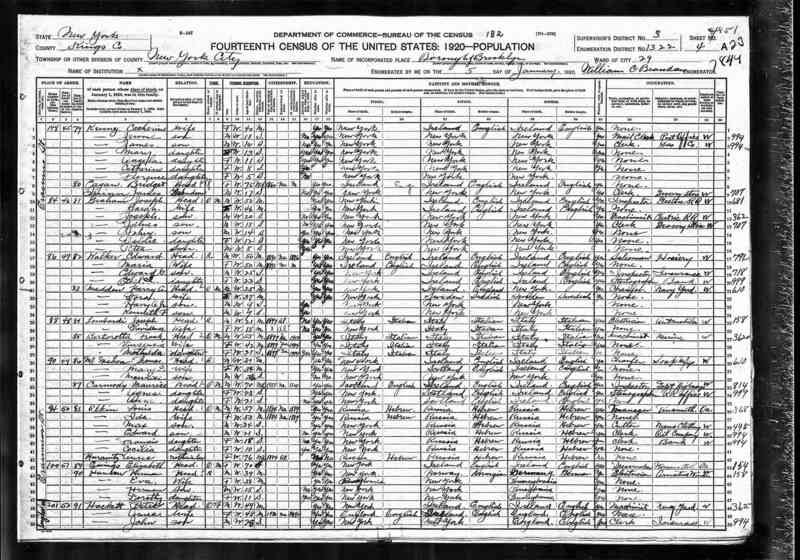 The name was Elkins, not Elkin, but the 1920 census for Frank’s parents also had the surname as Elkins, not Elkin. But what were they doing in Boston? I thought perhaps Frances had been born in Boston, but the census said that she was born in New Jersey. (It also says that Frank was born in Massachusetts, but that has to be an error.) It reports that Irving was born in New York and Stanley in Boston. Then I searched for records of Frank Elkin or Elkins in the Boston area, and I found on the Massachusetts marriage index a listing for a Frank Elkins and Frances Reiner, married in 1922, the year after Rebecca had died. Perhaps Frank had left NYC to start anew after losing Rebecca? Where had he met Frances? 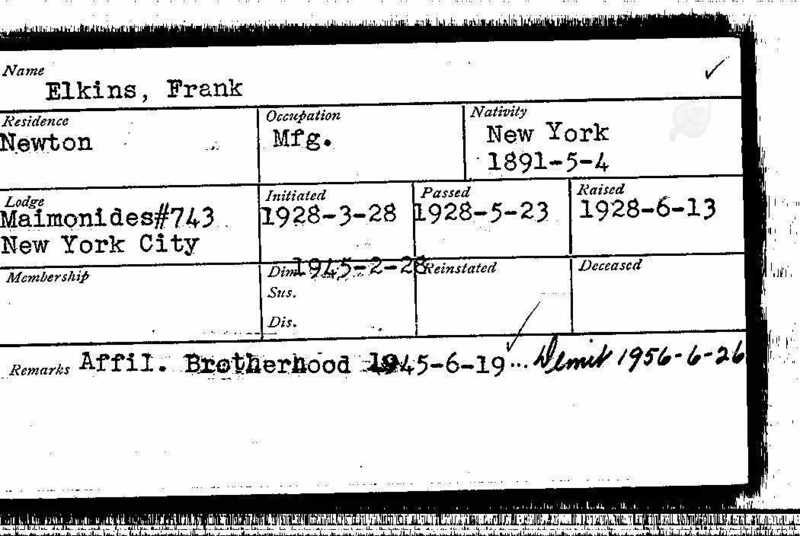 Stanley was born in Massachusetts, so they must have been living there in 1925 when he was born (which also explains why Frank is not found on the 1925 NYS census). But then they moved back to Brooklyn as of 1930, yet were back in Boston by 1940. 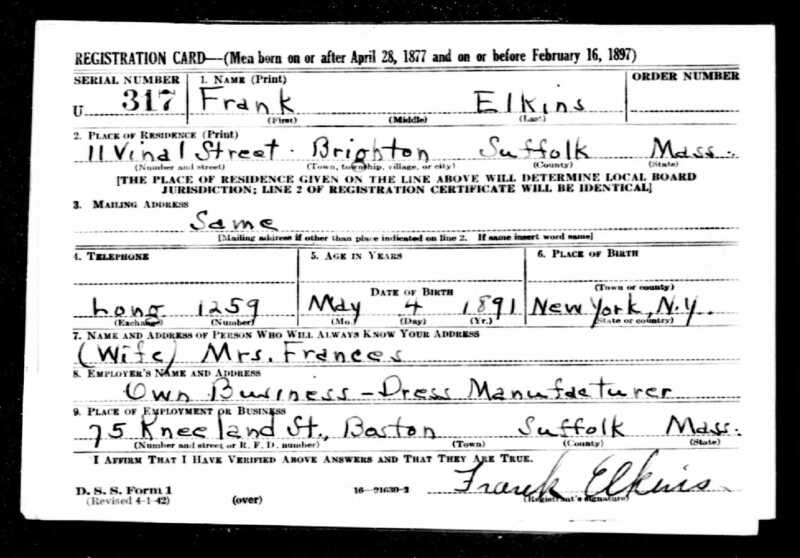 According to his 1942 draft registration for World War II, Frank owned a dressmaking business in Boston. His Mason’s membership card dated 1945 confirms that he was still living in the Boston area (Newton) as of that date. I was fortunate to be able to find one of Frank’s grandchildren, who told me that Frank had been a scrapper or bare-handed boxer when he was a young man. According to family legend, Frank had boxed with his brother, a champion boxer in the Navy himself, over who would get to date Rebecca Rosenzweig. Frank won that fight and not only dated Rebecca; he married her. Frank’s grandson also told me that Frank never forgot his first wife although he also loved Frances very deeply. Apparently Frank and Frances did a wonderful job raising Irwin and Stanley, as they were never thought of as half-brothers, but as brothers. 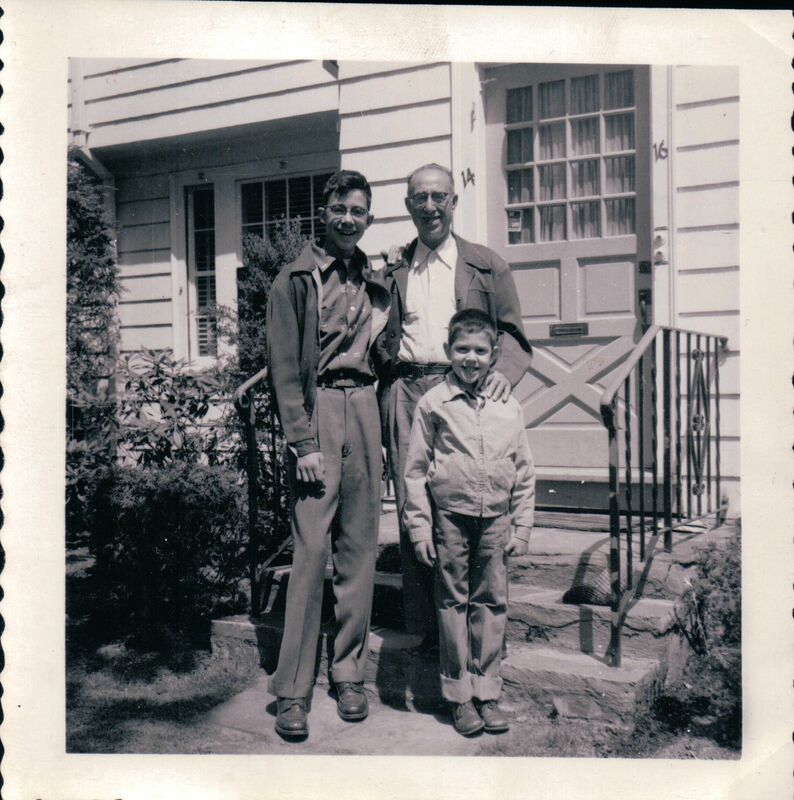 Frank also must have been a terrific grandfather, as his grandson said he still thinks of him often. 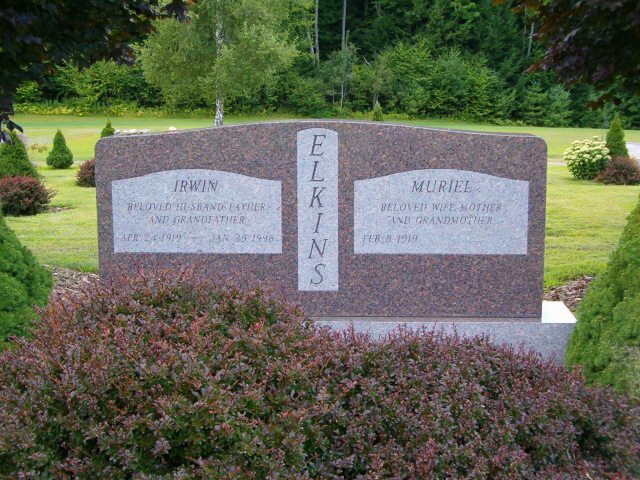 It appears that the Elkins family ultimately developed strong New England roots. Irwin, Rebecca’s son, my second cousin once removed, ultimately settled in Brattleboro, Vermont, where he and his wife Muriel were the co-owners of Brattleboro Kiln Drying and Milling Company, which they sold after they retired. They were both devoted to the Brattleboro community and made significant contributions to its growth over the 50 years they lived there, according to Frank’s grandson. He also told me that Irwin had been able to connect with some of Rebecca’s relatives in Florida late in his life. Irwin died in 1996 in Boynton Beach, Florida, and is buried along with his wife Muriel in Brattleboro, Vermont. When I had first seen the name Stanley Elkins on the 1930 census, I had immediately wondered whether this was the same Stanley Elkins whose book on slavery I had read in my American history course on the Civil War during college. The obituary confirmed for me that it was the same Stanley when it identified Stanley as “the son of Frank and Frances (Reiner) Elkins.” Discovering that gave me the chills. Stanley Elkins died only six months ago and lived not far away from me. He was not a blood relative, but nevertheless he was someone whose work I had read and admired, and he was connected to me through family. The last bit of research I need to complete regarding Rebecca relates to one of the other questions raised in my original blog post about her life: the child who was born before Frank’s World War I draft registration in 1917 but who died before the 1920 census, Daniel Elkin. I am still awaiting the death certificate for Daniel Elkin, and in the course of my subsequent research I have learned that a second child also had been born and died before 1920, Milton, so I need to order that death certificate as well. I also am looking for Rebecca’s death certificate to find out what cut her life short at 27. Once I obtain those documents, I will have learned a great deal about the short life of Rebecca Rosenzweig Elkin, my first cousin twice removed, my grandfather Isadore’s first cousin, and perhaps the cousin who introduced him to my grandmother. In her 27 years Rebecca experienced not only the loss of several siblings, but also the loss of two young sons. She never got to see Irwin, the one son who survived, grow up. I hope that by recording her life, the grandchildren and great-grandchildren she never knew will get to know a little more about her and her family. This entry was posted in Genealogy, Miscellaneous information and updates, Rosenzweigs and tagged Boston, Boston English High School, Brooklyn, Family, Frank Elkin, genealogy, Gustave Rosenzweig, New York City, Rebecca Rosenzweig, Stanley Elkins by Amy. Bookmark the permalink. Wonderful research Amy! Congrats on all of your finds! Thank you, Jana. The finds make up for the brick walls. Wrote above box, tell me if it didn’t go through! Hi, Marlene. I am not sure what the connection is to Rebecca and Frank Elkin. Can you explain? I have family at FTDNA also. I will email you. Thanks for reading and commenting!